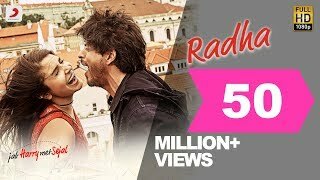 Radha Lyrics from Jab Harry Met Sejal starring Shahrukh Khan, Anushka Sharma: The song is sung by Sunidhi Chauhan, Shahid Mallya, composed by Pritam with lyrics penned by Irshad Kamil. We'll suggest you the best of latest songs. Click on 'Allow' to proceed.